Are you in pain—or know someone who is? With compassion and convenience, our team of proven specialists diagnose, treat, and rehabilitate old and new injuries. We integrate chiropractic care, massage therapy, and exercise rehabilitation. Why? So you get better. Faster. And, stay pain-free longer. With over 20 years of experience, we do it differently for better outcomes. We approach the treatment of pain with a “movement is medicine” philosophy…often without painkillers or surgery. Most of our patients do not need a prescription or a physician referral to be treated. They call direct—and work directly with our doctors. 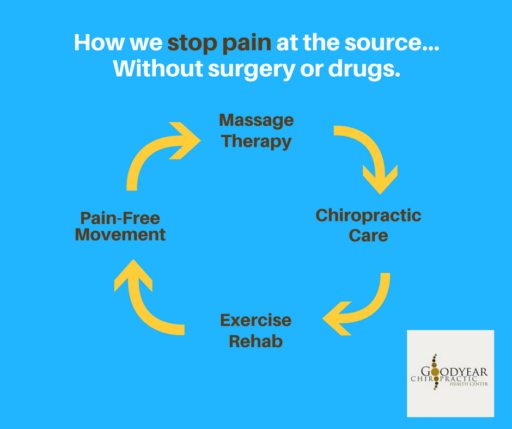 Through an integrative approach, our doctors and specialists treat the source of pain (Not just the symptoms) with a collaborative, often holistic approach. Therefore, our treatment options work for all ages, including pregnant women and those with compromised health conditions. we treat people suffering from work-related injuries, car accidents, sport and work-out injuries, chronic pain, and more. we offer second-opinions. we’re often the solution to surgery or pain killers. You’ll experience the difference. Pain Management Physicians, Massage Therapists, Chiropractors, Acupuncturists, Exercise Rehab Experts, and Physical Therapists work together to diagnose, treat, rehabilitate, and educate. Our integrative approach offers accelerated healing. You’ll get better. Faster. Stay pain-free longer. Through our commitment to continued learning and research-informed practices, we have a profound impact on the wellbeing of our patients and the Greater Milwaukee community.